We are starting the second week in BM 26th, with me going on Pick an Ingredient and make three different dishes. To make it very complicated (as if life isn’t already complicated), I had given three different combinations to be made. Trust me these days I don’t actually get time to sit and think through the entire theme list. So what happens on the morning of the announcement, rather just the time I did this time, these things came to mind and I just gave in, trusting on my friends capabilities to churn out things, no matter how tough it gets. Anyway this time I happened to face the music and it’s been pretty tough going. After spending quite sometime deciding on the first week dishes, selecting for the second week, pretty ease. I squared on Wheat flour and thought I will have so much to select from. Well again it was a game of hide and seek. Finally I ended up selecting the dishes and as always hoped for the weekend to let me complete the dishes. I was supposed to go with starters, well since that dish seemed to simply I thought of making it in the end, which turned out to be a bad decision as I never came around doing it. So you get to see from the last, meaning an Indian Sweet. 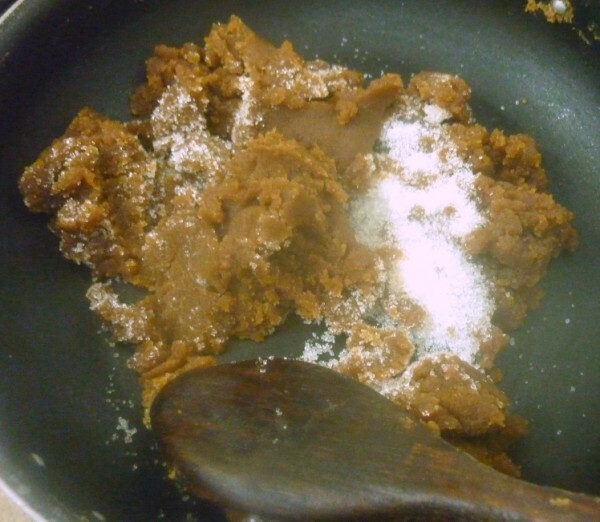 Though I have made Godumai Halwa two different ways, I always had a wish to make it with flour. I even bookmarked a recipe with it. Only I wasn’t able to find that recipe. In the end resorted to another one, I think this is from Chitra Vish of the Indus Ladies fame. I had this noted down and thought it will be best. This is rather called as Wheat Flour Kesari, and as a Rajasthani sweet. Guess all our states almost make the same sweet and call it by different names. I remember the other halwa made with flour and had a similar measurement. or the first time, I decided to measure out the ingredients as they were only 3 of them. I wanted to see how much I end up using it. 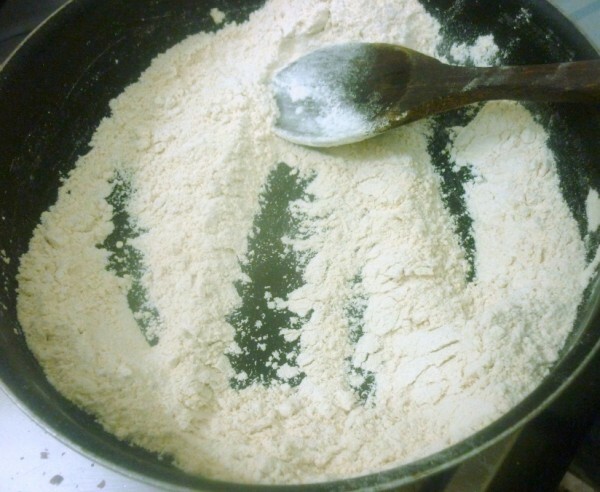 I used 1 cup flour and measured out 1 cup ghee and 1 cup Sugar. I started with 2 tbsp of ghee to make and almost used up 3/4 cups. With the texture I ended up with, it was fine and tasted great. If you want, you can use up the entire cup of ghee. Sugar I had to use another half cup to get that halwa taste. On the whole it ended up being such a delightful task. I am also planning to make the halwa with the dough, so let me plan that as well! 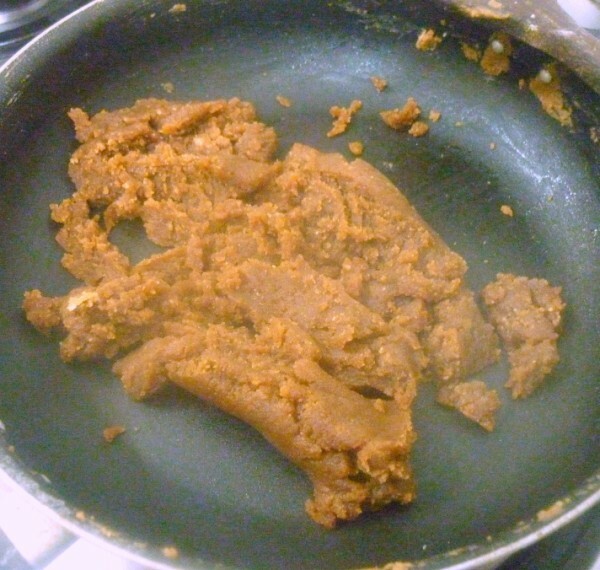 In a non stick pan, heat and dry roast the wheat flour without add ghee. Continue roasting till you see the atta turn colour. 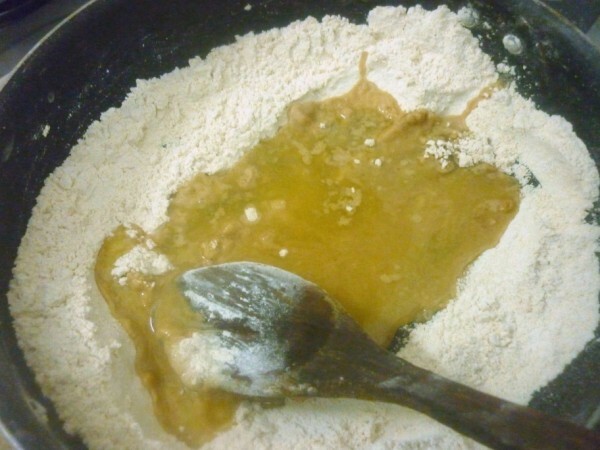 Next add the ghee by 2 tbsp and continue mixing, at this stage the flour will turn to watery and you should continue stirring it all over. 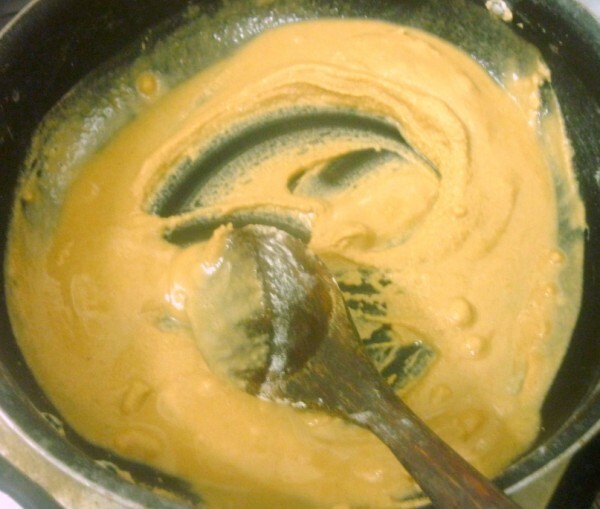 After nearly 10 mins of stirring, add sugar and mix everything well. 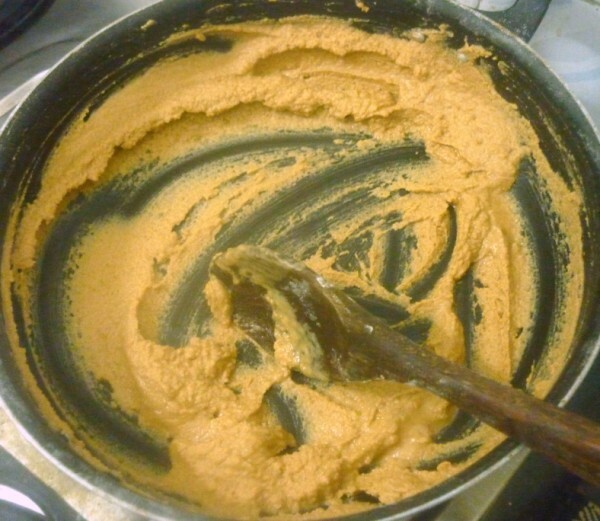 At this stage the mixture will be granular, but you can continue mixing everything together. Once you are done with 1 cup of sugar, add water, start with 1/2 cup and combine everything together. 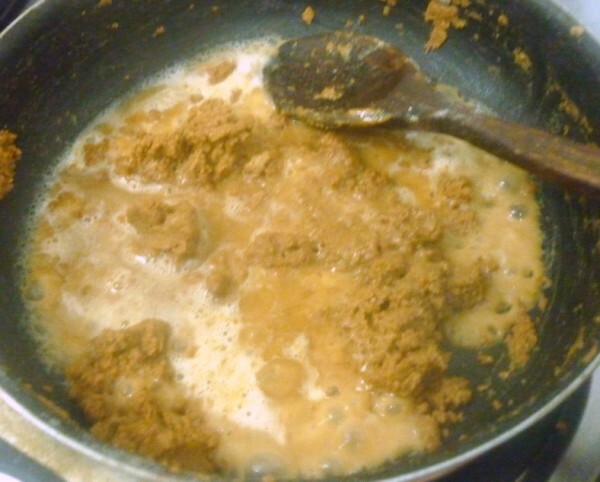 When you add water, the mixture becomes very soft, you can continue with adding ghee and stirring again. 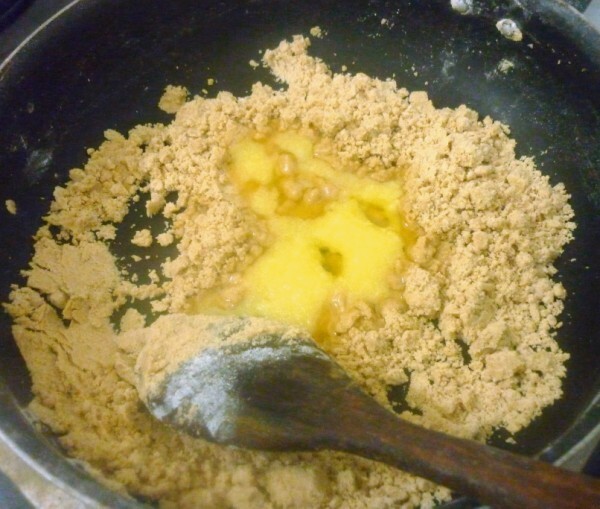 Continue the process of add ghee and more sugar till you reach 3/4 cup of ghee and 1 1/2 cup of sugar. Add cashews and saute well. Stir everything together and serve hot. You can fry the cashews in the beginning and keep aside, I added to the pan and found it easy to make as well. remember to add ghee before it reaches that stage. I stopped with 3/4 cup ghee, you can complete the entire 1 cup if you prefer. Also I used a wide non stick pan, stirring on a wide surface was little hard, you can select a smaller one. Looks delicious valli. Love that deep color on the halwa I have got some samba wheat flour from india to try asoka pudding, may be now will make some wheat halwa too!! 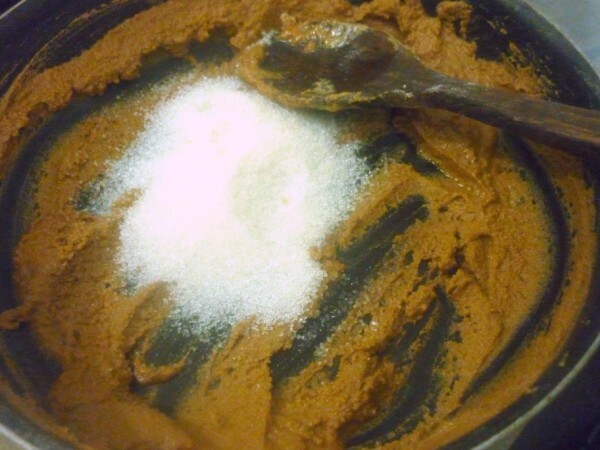 Well the basic to halwa is the same…only I use less sugar, but halwa is halwa, one of the best and quickest to prepare Indian sweet..and so many variations too. Love it anytime. Simple & easy recipe. Looks lovely & tempting!! Wow you really took the color to the new level. First I thought you have added cocoa or chocolate. Stunner halwa this is. love the deep color you got – looks so yummy! Looks yummy and tempting…nice clicks. 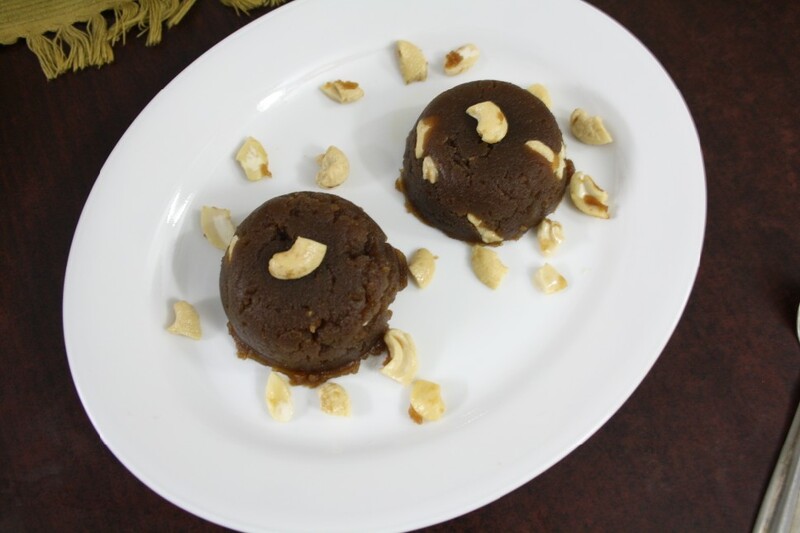 When i saw the deep colour of this halwa i thought you might have prepared this halwa with jaggery. 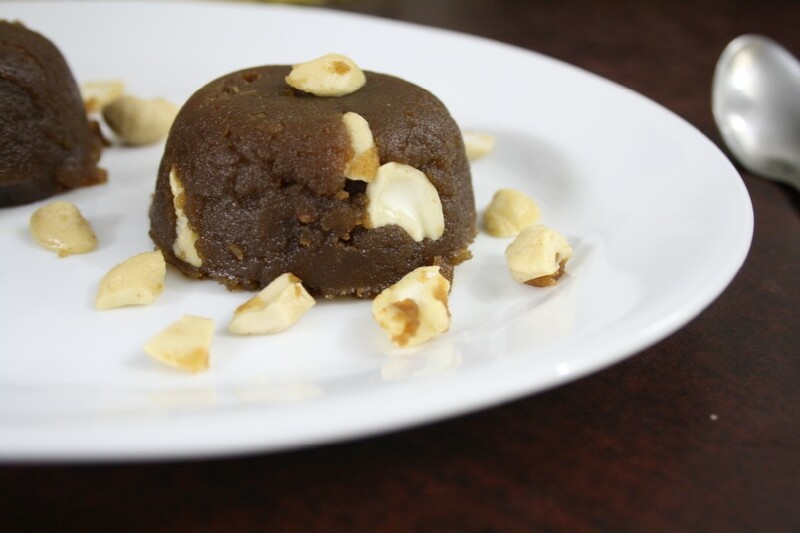 An easy halwa to prepare for a sudden craving. 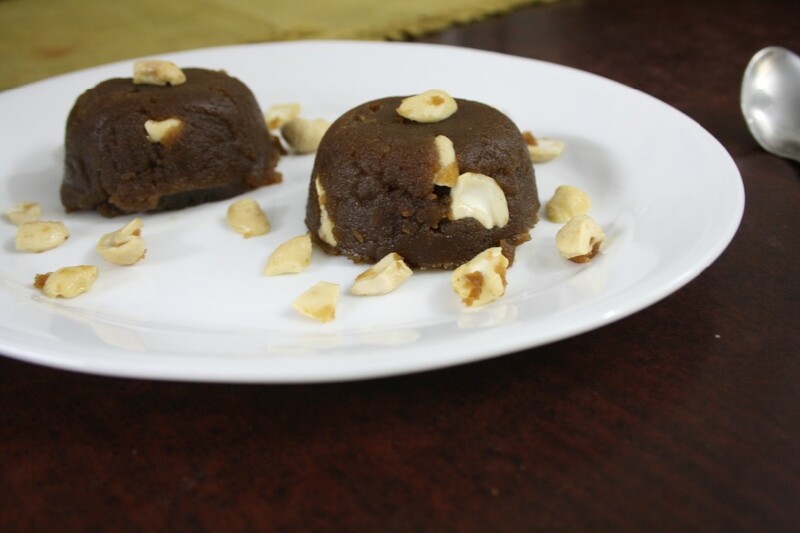 This almost looks like chocolate halwa Valli. Very tempting indeed!I Find your detailed pics and notes so useful always! 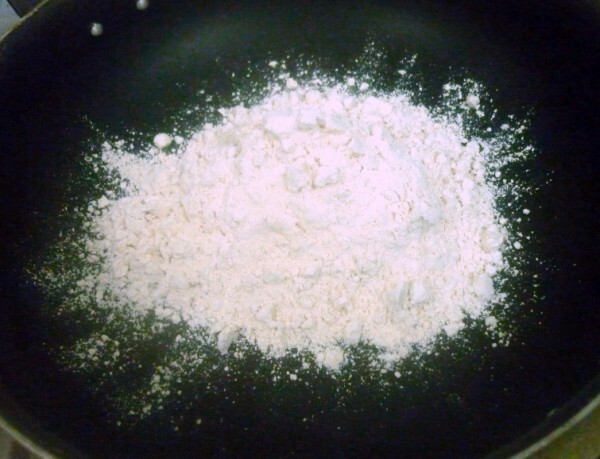 One of my favorite sweet, but I haven't tried with flour. Color looks so different and unique. This looks like some chocolate dish.. you really did some hard work to get this color.. 🙂 looks amazing.. I thought I commented here!But can't find it! 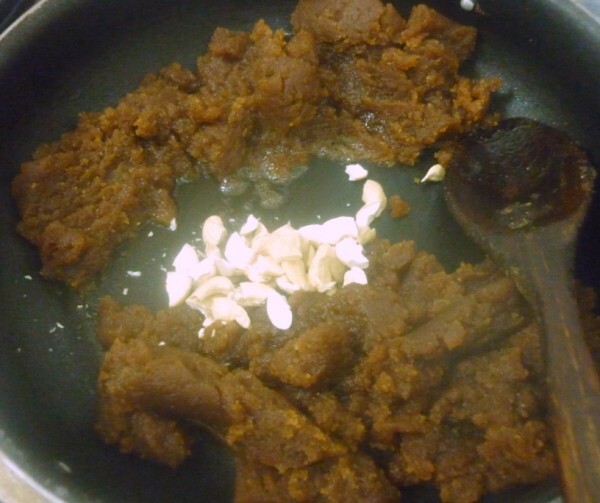 Anyways, nice color to the halwa.I learnt from out ICC moong halwa preparation that more the ghee better the texture and taste!Never prepared wheat halwa…. What alovely color Valli looks so yumm . 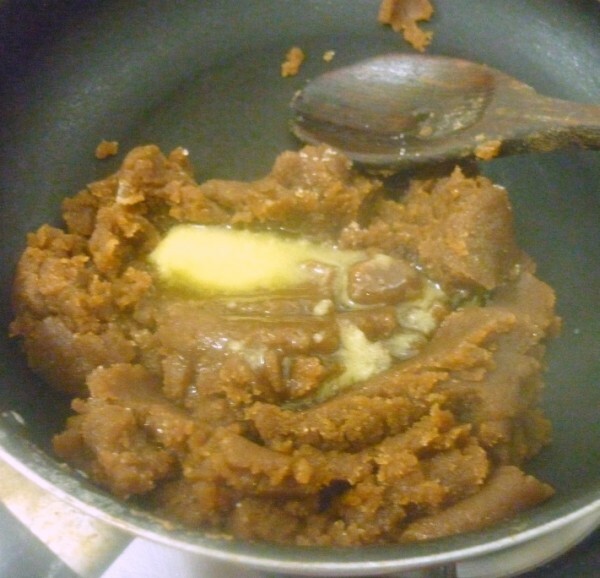 I like wheat halwa then maida halwa or any other halwa. 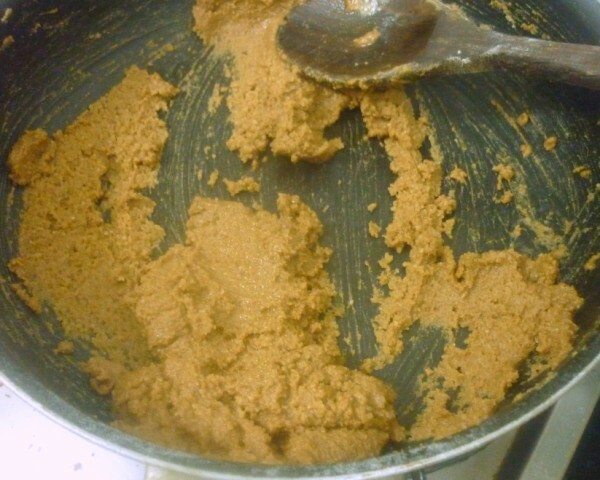 I saw a recipe for Pineapple wheat flour halwa recently and was thinking of it would taste. 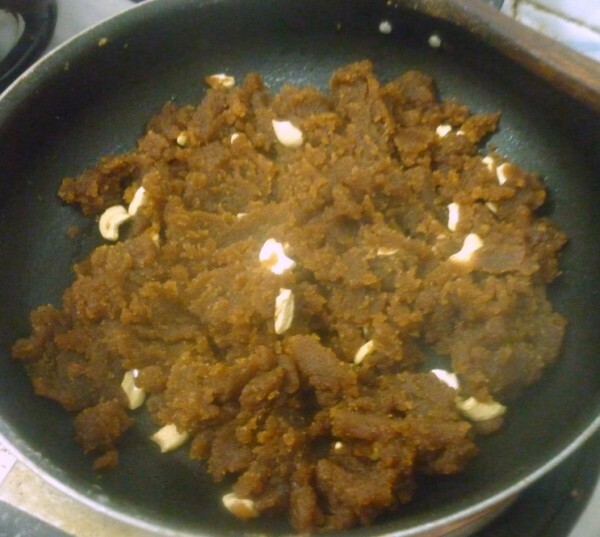 Now that I know wheat flour halwa looks amazing, I'll probably try that version with pineapple.